Fish in sauce is a special Chinese influenced Fish curry which is quite delicious and full of flavours. Fish pieces are fried and cooked in a spicy, sweet and sour tomato gravy. During my childhood, this used to be my favourite fish curry as the red curry was quite spicy for me. The saucy curry was a better option for us children. Now my children prefer the same as they find the Kerala Fish curry too spicy. Fish in Sauce is a Indo Chinese preparation, with Indian spices and chinese sauces that makes a delectable combination. An awesome dish to lure your little ones to eat rice. Fried fish and the spicy yet sweet and sour gravy makes this special “Fish in Sauce” more enjoyable to the palate. 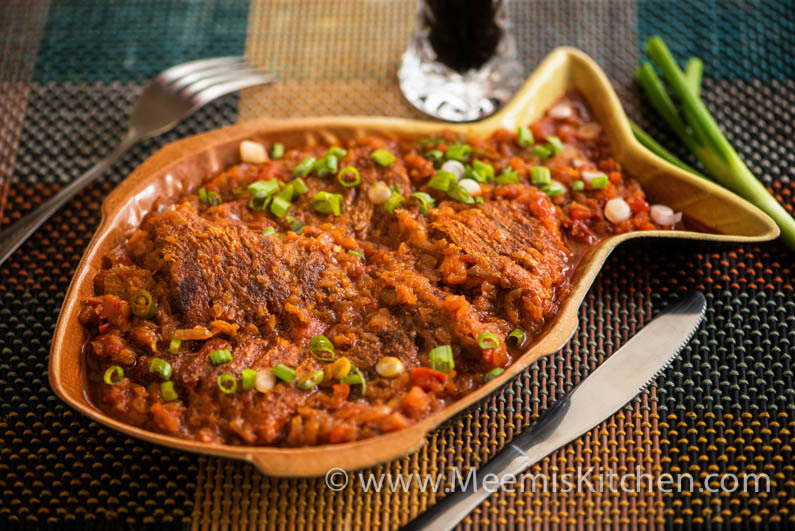 It can be made with any fleshy fish, or fish fillet but my mom used to make it with this Kilimeen (Sankara/ Pink perch) and even though I have tried with other fish, I favor Kilimeen (Sankara) to make fish in sauce. Could be because of my nostalgic memories, so you can try variations. Like Chili Fish, Fish Manchurian or sweet and sour Fish, this Indo chinese dish is also very flavorful and tasty. If you like Spicy Indian or Kerala Fish curry, check Alleppey Fish Curry, Fish Masala, Tangy Fish curry, Ayala Curry with Mangoes, Pressure cooked sardines, Fish in Cabbage, Karimeen Mappas, Goan Fish Curry etc. 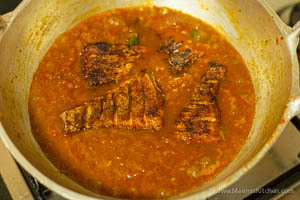 This Fish in Sauce can be a side for any rice dish like normal Kerala Rice, Fried Rice, Pulao or Rotis. Your kids are going to love this exceptional dish and you are going to thank me for sure. So next time you have guests, try this innovative style fish in sauce and get all the compliments for your cooking skills. Have a go!! Clean the fish. 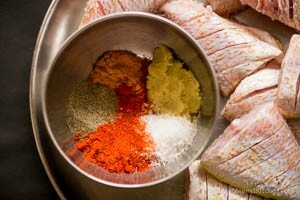 Make slits on the fish (if you are using fish slices, avoid this step) and keep aside. 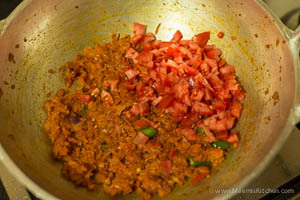 Make a paste with the ginger garlic paste and all masalas, salt and little water. Coat the fish pieces with half of this paste. Heat little oil and shallow fry the fish pieces. Drain and keep aside. Heat oil in kadai, add chopped onions, round cut green chillies and sauté. 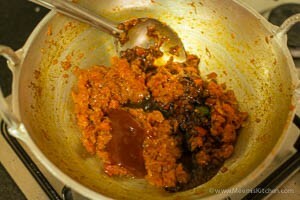 When the onions become translucent, add the remaining masala paste and fry for two minutes. Chop the tomatoes and add this to the gravy and fry for some more time. Add the Soy sauce, Tomato sauce and sauté. Add the vinegar and add 1½ glass water to make gravy, adjust the salt and put the fried fish pieces and cover and cook for 3 minutes on low flame. Transfer the saucy fish to a serving bowl and decorate with spring onions. Have a great meal with yummy fish in sauce. Fish in Sauce can be a side with any rice dish. The soy sauce used is light soy sauce in the recipe, and if you are using the dark soy sauce reduce it to almost half and taste and add more if required. The same applies to vinegar; add just more than half measure and taste and adjust the sourness level to your liking (I have used mild fruit vinegar, if it is too pungent, it will spoil the curry, hence to be on the safe side). 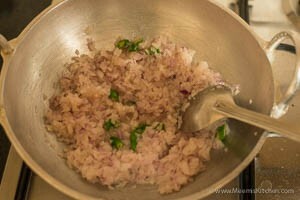 The oil used for frying fish can be used for sautéing the onions, if the color is fine. If the oil is dark and spoiled use fresh oil instead. The sweet tomato sauce/ ketchup is used. Not the chilly tomato sauce. The gravy should have a nice blend of sweet, sour and spicy flavors. Enjoy a great meal. Let me know if you like it. God Bless! !